The years before the Civil War (1800-1860) were known as the antebellum period. During that time, leaders of the rice, cotton and tobacco industries built stately homes for their families. The designs featured columns inspired by Greek and Roman revival architecture, with open porches and ornate interiors. More than two centuries later, these grand manors still stand and have opened their doors to visitors. This historic house was built in 1825 by Scottish shipping merchant Charles Edmondston and provides spectacular views of the Charleston Harbor. It was one of the earliest homes to be constructed next to the city’s sea wall and away from the busy activity of the warehouse district along the wharves. During the Panic of 1837 the Edmondston family fell on hard times, forcing the sale of the house to Charles Alston. This magnificent home also acted as a safe haven for General Robert E. Lee when a raging fire in a Charleston hotel threatened his safety in 1861. Today, the Edmondston-Alston House proudly displays many 19th century items like furniture, books, family portraits and silver. This magnificent antebellum home has been preserved, not restored, making it the most intact museum house still standing from a forgotten era. The residence was built in 1820 and featured an impressive piazza (double-sided porch). In 1827 prominent merchant William Aiken Sr. purchased the property and began renovating the house. After his death, his son, Governor William Aiken Jr., inherited the home and began traveling to Europe with his wife. They brought back many exquisite pieces of art and impressive furnishings. The Aikens’ love of art was so great that they commissioned the construction of a gallery to showcase their impressive collection. Many of the pieces in the Aiken-Rhett House remain on display in their original rooms, along with original the wallpaper. Patriot leader and Declaration of Independence signer Thomas Heyward Jr. built this Georgian-style double house in 1772. In May of 1791, Charleston rented the home for President George Washington to use during his weeklong stay in the city. After the President’s visit, it was commonly referred to as the Heyward-Washington House. Visitors to the house will can view an incredible collection of Charleston-made furniture dating back to the 18th century. Among its possessions is the priceless Holmes Bookcase, widely considered to be one of the most prized pieces of American-made Colonial furniture. This National Historic Landmark holds the honor of being Charleston’s first historic house. 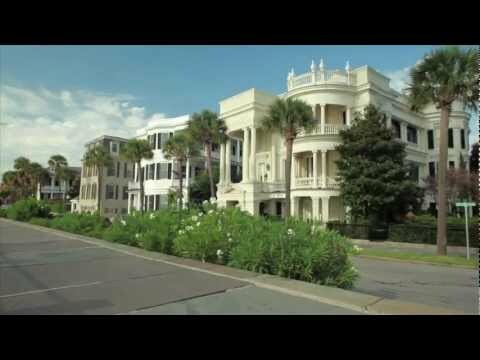 Purchased for $200,000 (Confederacy currency), it’s the largest privately owned historic home in Charleston. The 24,000-square-foot-structure, built in 1876 in the baronial-Italianate style, opens to a grand entrance hall that is 14 feet tall by 14 feet wide and 64 feet in length. The mansion features 23 fireplaces, a 75-foot domed ceiling, 45-foot covered skylight, fancy chandeliers, private elevator, elaborate plaster with moldings and a music room. At the turn of the 20th century, Louis Comfort Tiffany designed decorative painting and installed lighting in the Calhoun Mansion. Though not from the antebellum period, this architectural wonder, noted for it Charleston workmanship, has received numerous accolades including high praise from Architectural Digest, Forbes and American Castle.